One week from now will mark a full year since my last post. I've bought a number of things since then, but in keeping with my original intentions—despite many gracious emails from readers—I decided to stop the project after its first year. The timing happened to coincide with a number of life changes over the next year that would have made the project even more difficult(and frustrating) to continue. I decided in the beginning that if this ever became more of a burden than a pleasure, I would stop. I did however continue saving tags, receipts, and packages for months, just in case I had a change of heart and decided to continue cataloging my purchases. After a year of meticulously keeping track of everything I bought, it was hard to alter those habits, even though, for the most part, they are good habits to have. Being aware of what we buy, why we buy it, where it comes from, and where it goes when we are done, are things we should all consider when making purchases. Through this project and my thoughts on consumerism I was able to meet Rob Walker (who interviewed me about it) and invited me to contribute to the Unconsumption blog, where we've created a dialogue about what happens to things once they've reached the end of their intended life cycle. I also discovered Kate Bingaman-Burt who has been doing a similar project for many more years than I have and with much more creativity. There are many ways for you to fill your RSS feeder from here on out and many other inspiring people doing cool things. Since I last wrote, I had moved to Brooklyn, worked in Chelsea, was let go—thanks Bernie Madoff, started my own studio Welcome™, advised a Project M session in Maine, gave away Free Pie, and then moved South to a small town in rural Alabama to open PieLab. I've been in Alabama for nearly 6 months, living in a house with dirt walls, surrounded by the beautiful architecture from Rural Studio, as well as severe rural decay—mixed with generous southern hospitality and some very backwards traditions that I've begun to view with new perspective. I will continue living here and working with my own clients, while taking part in various Project M initiatives. I'm applying to grad school for next fall and plan to continue enjoying the amazing experiences that this new path in life has provided. Thank you to everyone who followed this project as it developed. I suffered a great loss and choose to turn a tragedy into, what I hope was, an inspiring and thought provoking experiment in consumerism. What we buy is important, but what we don't buy is even more important. Continue to question your own consumer habits in the future—after this, I don't think I'll ever be able to stop. 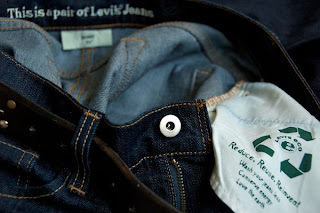 Comment: When I bought my first pair of Levi's 514's I quickly became a Levi's convert. I fell in love with this all-American brand that had been trampled by a wave of expensive designer denim. The two pair I have are doing fine, but they are starting to show some wear and tear. I decided to add another pair to my wardrobe cycle to slow the deterioration from wearing and washing them. My friend Eric works at the Levi's store, so I decided to pay him a visit. He was generous enough to hook me up with his discount—which happened to be 50% off this week. He convinced me to slim down to a pair of 511's and came across the new Levi's Eco line of denim. The style I bought are made with 20% recycled cotton (which I'm sure is canceled out by its trip from the factory in Hong Kong), while the other styles are 100% organic cotton. Although the 20% recycled content seems a little greenwashed, I don't know what kind of manufacturing restraints exist with using recycled cotton—so it may be the best they can do at this point. But they fit great, look great, and cost much less than Paper, Seven, or nudies. Comment: Since I got back from my trip, I have been spending time in multiple places, and all of the tags, packaging, etc. that I need to post items I bought for my trip are in one of the places I haven't been too recently. So I decided to forge ahead with what I have bought recently and just back post when I get the chance. This was another free book. My father works for a media outlet, and publishers continually send new books to them in hopes that they will get reviewed and plugged. He recently found out that the mail room had just been throwing them out, so he began saving them. I was looking through the stack of books recently and this one really stood out. It's a fascinating look at the world's sanitation. 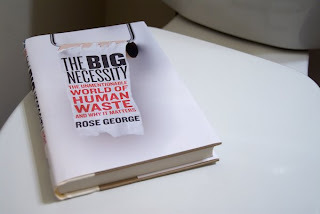 This book covers everything from the 6000 miles of sewer under NYC, to the toilet technology in Japan, and the fact that health related deaths—caused by poor sanitation—are higher than that of AIDS among children in third world countries. I am absolutely enthralled by this book despite it's "taboo" topic. I'm back in the States and behind on posts. I'm sorry it's been so long. 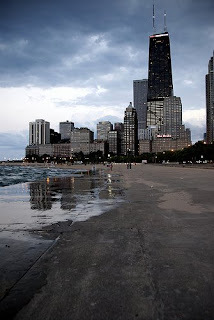 Everything wrapped up so quick in Chicago that I didn't take the time to keep up with posts. I purchased a number of things that I needed for my trip to Africa, some of it I left there and I even had a pair of sunglasses stolen (imagine my luck). At this point I'm kind of a pro at having things taken, so it upset my host much more than myself. The trip was amazing, eye-opening, heart-breaking, humbling, and life-changing—just to be brief. I want to thank everyone who supported this trip, which I have dreamt about for years. I am already looking forward to going back in the future. I have made many friends there, who I already miss dearly. I have much I could say about the trip, but for now I'll let my photos do the talking. Stay tuned for more updates and back posts on all the gear I purchased for my journey. I'm coming up on the one year anniversary of zero day and I'm having a sale. As Rob Walker would say, I'm "unconsuming." There are many reasons why—less than a year after losing everything involuntarily—I am voluntarily getting rid of more stuff. If you've noticed the lack of posts recently, it's because I have reached a new place in my consumer mentality that has afforded me much more control over what I buy. Don't get me wrong, there are still loads of things I want to buy, but I've been learning to enjoy the things I already have—instead of hording a giant collection of stuff that I never have the time to enjoy. One thing I've learned in the past year is that I value experiences much more than any material possessions I could ever acquire. I would rather travel to new cities, enjoy dinner with friends, and spend time outdoors. None of which really require a home with an attic, basement, and garage filled to the ceiling with junk. So to follow through on this life lived for experiences instead of a collection of material things, I am downsizing significantly again—this time on purpose. In a week, I'll be hopping on a train headed east and then catching a plane to Africa. When I return, I will be moving to NYC to finally call that great city home (at least until I can no longer ignore my desire to return to SF). I'm looking forward to living someplace—for the first time since college—where I will actually know some people. I will be reconnecting with some great friends and fellow designers who have already been enjoying "the center of the universe." All of my furniture is for sale on craigslist, and half of it has sold or is spoken for. But everything else I own is up for sale too, if the price is right. I will also be selling things at a fundraiser yard sale (for my trip to Africa) this Saturday in Chicago. This is my mulligan on the past year. I want to leave Chicago with as little as I arrived with and head to Africa, where I can do my part in helping those who never had anything to begin with. Thanks to everyone who has followed this over the past year, I plan to continue writing and evaluating what I buy, but I am considering new directions. Since I hope to buy much less in the near future—aside from the gear I will be buying for my trip—things may get boring around here. 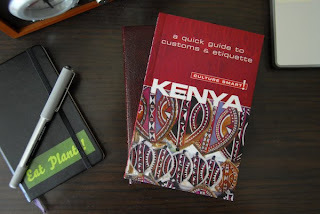 Comment: This book has been on my "must read" list since it first came out. I almost bought it at the airport during my last trip, but it was still in hardcover and I didn't want to lug it around. However, on my most recent trip—with a delayed flight and nothing to read—I was happy to see it had been released in paperback. 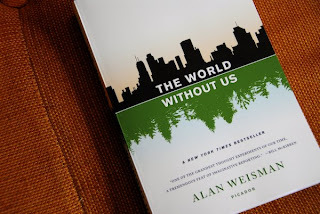 This book is a fictional look at how the world would recover if one day every human being on Earth vanished. As sci-fi as it sounds, it sets the stage for a very researched view of how nature would take back urban landscapes and how quickly everything we have built would crumble without our constant upkeep. The lessons in ecology as well as the physics of nature are incredibly inciteful and they create a fascinating new perspective on the "permanence" of our great cities and all our monumental accomplishments. I also really love this book's cover, the simplicity is brilliant. *There were a few moments tonight, during our second attempt at landing in Chicago's stormy weather, where I thought this would be the last thing I ever bought. While we were only a few hundred feet from the ground—and approching fast—the plane suddenly dropped like a rock, making the passengers experience a few seconds of weightlessness before the plane shot straight up into the air. The pilot informed us that he didn't think a third attempt was wise and we would divert to St. Louis and wait the storm out there. Good call chief! This morning when I was trying to catch my flight back east I had a little altercation with the TSA—sadly not my first—and almost missed my flight. 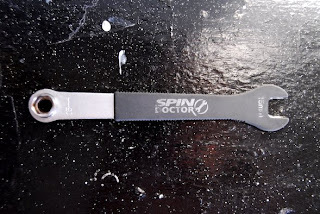 I want to let everyone know—who like myself, hasn't read and memorized the list of all 347 prohibited items on the TSA website—that any tool over 7 inches in length is not allowed in your carry-on. Even if it's just barely over 7 inches. Even if it's less dangerous than a 6.99 inch screw driver, which happens to be allowed. The TSA are robots, trained to respond to all situations in a scripted manor without any use of judgement, common sense, or rationalization. After speaking with three different agents(one who was a supervisor) and being informed three times of all of my options (none of which were viable), I told them to just keep the wrench so I could catch my flight. They promptly stopped me and asked, "Sir, are you voluntarily surrendering the item?" No, I'm not. You guys are confiscating it. I don't want to give it to you. It's mine. It's not dangerous. I need it to put my bike together when I arrive at my destination. There is nothing voluntary about this situation. What do you do with these "surrendered" items anyway? Is it thrown in the garbage and sent to a landfill? Does it get auctioned off? Do you guys grab some beers at the end of the day and divvy up all your loot? Is it donated to a charitable organization? Or do you blow it up to make sure it wasn't a bomb? Inquiring minds must know. I ask all of these questions because I'm sure that the confiscation of my possession is not a rare occurrence and people who are in a hurry are constantly "surrendering" their items, never to be seen again. But this forces the victim to purchase a new item just to replace a perfectly good one that the victim already owned. This really aggravates me. I even asked if they could place it in the Lost and Found so I could retrieve it on my way home (like my lost keys a few months ago). But I was told they "couldn't be responsible for doing that." It's great to know that we have irresponsible people protecting our airports. Heaven forbid something occurs that a script has not been written for, we will all be doomed at the hands of the almighty TSA. Comment: Sorry for another delayed posting (with a few more to follow). I was traveling last week and a couple work outings and friends visiting have kept me busy ever since. I'm excited to finally share this little side project I recently finished. This is a shirt that I designed and had printed for a collaborative project with my father. 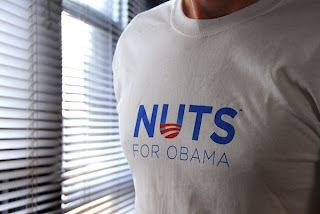 After the whole Jesse Jackson debacle, he called me up and asked if I could design him a shirt that said "Nuts for Obama." Over the next 48 hours I got to work on shirts, a website, and acquiring quotes for the production. It all came together pretty fast and without a complete plan of how to get the word out—especially in a market full of 1000's of Obama related shirts. However, I think the provocative nature and double entendre in the message make for a great shirt. You know you want one. Yes I am shamelessly plugging my own wares for sale. Even if you don't buy one for yourself or as a gift or to burn in effigy—atleast visit the site so my late nights weren't spent in vain. Comment: Aside from this book having one of the most amazing covers ever, it also discusses a topic I have been hungry for information on. 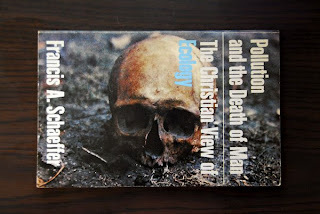 Ecology, sustainability, treehuggers and Christians don't go together very often. Most Christians seem to believe that being given dominion over the earth is a free pass to plunder it of all it's resources and trash it like a rockstar in a cheap motel room (but without as much style). However, I believe it's our responsibility to take care of it, being that we are the only species who can reason and solve problems outside of our natural instinct to survive. My pastor gave this too me, following a conversation we had about investing in solar panels for the roof of the church. He had an extra copy laying around and thought I would enjoy reading it. What I find fascinating is that it was written in 1967 and it's foresight and relevance is incredible. We've known about the issues we are facing now 40 years ago and have made little to no moves to curb any of them. With our population growth out pacing the regeneration of our natural resources, we really need to start thinking—and more importantly—living differently. Alright, enough preaching from me. Since it seems like it's been so long between posts recently, I wanted to bring up the catch 22 of writing a blog about the things I buy, while I'm learning to buy much less in the process. I talked about this issue in my interview with Murketing, and it can be frustrating because I enjoy writing and sometimes I feel compelled to buy something, just so that I can make a new posts. And with my recent announcement and solicitation of support for my trip to Africa, I have been even more conscious than normal about what I buy and how I'm spending my money. I will need to start buying gear for my trip soon though, so be on the look out for that—unless anyone has some camping/backpacking/safari gear they would love to loan or donate to the trip. I'm also interested in getting a portable solar charger for my camera, anyone have experience with the Solio? I plan to capture my upcoming journey as best I can for everyone who will be interested in reading about it when I get back. Comment: This could be my first unofficial sponsorship. 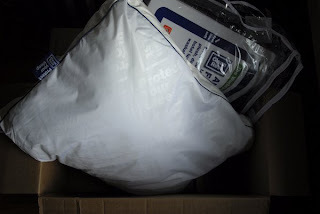 After discovering my blog and reading about my mystery allergy, Gary Goldberg (the CEO of Clean Rest) was generous enough to send me one of their new allergy free pillows. As I've said before, I love free stuff, especially if it's something useful that I would have bought anyway (and I needed an extra pillow for guests coming to visit). The most ironic part of receiving this pillow in the mail today, was that I had just come home from an appointment with an allergist, where they did a full skin test to find what I'm allergic too. But—not surprising to me—the results all came up negative. 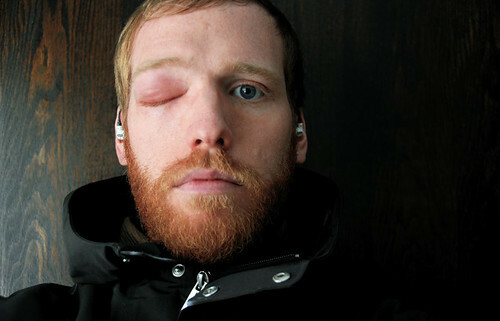 So far, whatever is causing my eye lids to swell up on a quarterly basis, is still unknown. I happened to have another reaction last week (almost 4 months to the day of my last episode...right on schedule), so I called an allergist to try to solve the mystery, once again. I actually looked at these pillows when I purchased my Tempur-Pedic, but it's hard to really test out a pillow when it's on a shelf at the store. I remember feeling the Clean Rest (with my hand) and thinking it was too soft, and I would need to buy more than one. Since they each cost $40, after buying a couple I would have been paying as much as I would for the Tempur-Pedic. I went with the space-age memory foam based on family recommendations. It took me a couple weeks to get use to the firmness of the foam, but (sorry Gary) I've grown to love it. However, the Clean Rest pillow is much better for lounging on the couch and napping. If I had a few of these on my bed, they would be great. It definitely simulates the soft fluffiness of down remarkably well for being synthetic and the health benefits from the pillows allergy barrier are great. This is also not as crinkly and plastic feeling as the allergy covers you would put on regular pillows, a huge plus if you've ever experienced those. Thank you so much Gary for sending me the pillow and protecting my sleep. Comment: If you are one of the few people who have followed this project from the beginning or have just found it recently and actually took the time to read back through all the old posts, you may remember, while I was defining the purpose of this project, I voiced my desire to do mission work in Africa. At the time, though I would have loved to do so, the opportunity wasn't available. 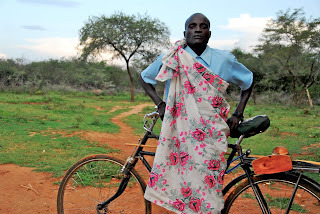 However, less than a year later, a door has been opened that will lead me to Kenya this fall. I have known about it for a couple months now, but just committed to the trip yesterday. I am very excited to finally make this journey and I have a lot to do in the upcoming months to prepare for it. For the last few years, faith has been an important part of my life and it has played a large roll in how I've dealt with this experience and how I've grown from it. We are such a privileged society, and far too often we take those privileges for granted. I know that this trip will have a profound impact on my evolving perception of our consumer culture as I experience first hand what it means to have not. Comment: First off, I feel terrible for buying two pair of shoes in less than 3 days (part of the reason I delayed making this post). It's funny that I now think of a pair of shoes as a substantial purchase. It's something that is used frequently (or should be) and has a substantial lifetime (compared to so many other things in our disposable culture). My problem with shoes is that my lifestyle tends to warrant having many pair. It's like my growing collection of bikes, they all serve a specific purpose. I can't run in laceless Converse and I can't play tennis in running shoes (although that's debatable). 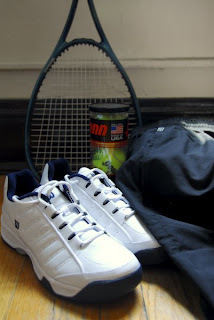 Tennis is one of the few things in my life that I will undoubtedly say that I was really good at. Was being the key term. I spent many summers in tennis camps and taking private lessons, honing my skills (i.e. a wicked serve) only to quit playing my sophomore year in high school because of a bad relationship with my coach. Much to my father's chagrin, I gave up tennis for a guitar and a punk rock band (we played two terrible shows before breaking up). I have only played tennis once since then, my freshman year of college, and I've continually told myself that I am going to start playing again. I dug my old racket out of my dad's basement, last fall while I was back east visiting, and it has been sitting in my closet ever since. Last week I finally dropped it off to be restrung, picked up some balls, shorts (the only pair I had were cut off jeans), and my second pair of shoes in a matter of days. I decided that tennis balls and string fall under the category of disposables, since they don't retain any value once you begin using them. I also learned that Penn (America's #1 selling ball!) is the only tennis ball made in the USA. So next time you are in the market for balls, be a patriot and buy Penn. Comment: I'm not much of a sneaker freak, occasionally I come across a pair of Nike Dunks that I love, but they're just not my style. 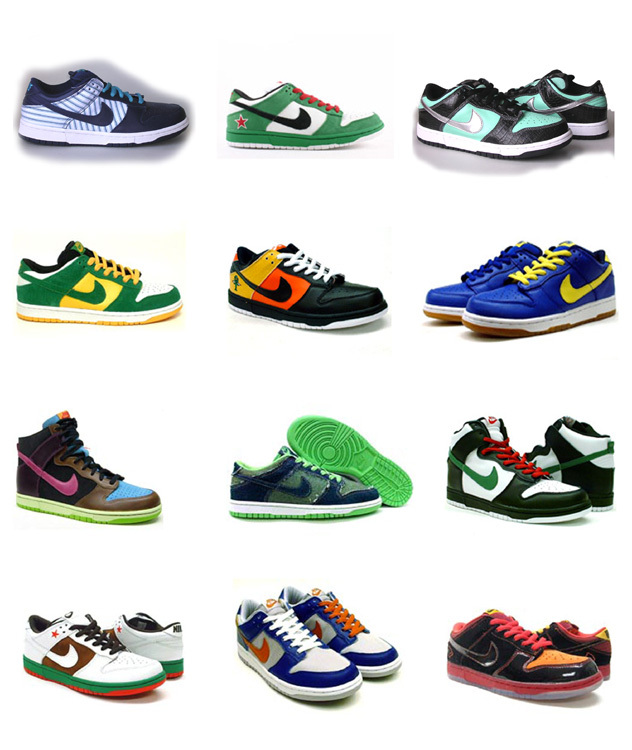 Sneaks are a lot like vinyl toys, I love the idea of them, but I could never see myself having my own collection. 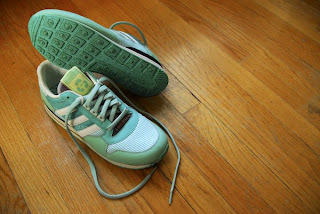 However, when I came across the new Adidas Grün collection I fell in love with both the medium and the message. Since I decided to start running again and my laceless Allstars won't do, I was in the market for a new pair of shoes. What better then a classic runner made from the latest recycled materials? Adidas Grun is a collection that aims to reduce our impact on the environment. To do so, natural and recycled materials have been used in the construction of these products. This means that the products unique construction and use of materials does not guarantee that they will perform like Adidas athletic shoes. These materials may require special care. Some recommendations include avoiding damp environments, prolonged exposure to sunlight and other conditions that may stress the materials. I figured with a lack of history using the materials this serves as a liability disclaimer for Adidas, but I still plan on running in them as if they were any other pair of shoes. It's discouraging that a company as large as them won't stand confidently behind their product. I guess I'll see how well they hold up. A couple weeks ago I was interviewed for Murketing.com and then Lloyd Atler, over at Treehugger picked up on my site and made a post there last week. 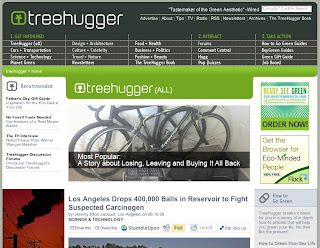 That was pretty exciting, since I've been an avid Treehugger reader for years (way before Discovery bought them) and they have a very large audience, which means I have many more people looking at photos of my socks and underwear than I ever expected. However, everyone I have heard from who admires the consideration put into my purchases, and who long to remove themselves from their own overwhelming collection of possessions is always encouraging to hear. It's good to know that something many would perceive as tragic, can be used to inspire others to contemplate their own consumption habits. Publisher: Not For Tourists, Inc. Comment: I bought my first Not For Tourists Guide back in early 2006, it was for NYC then—and though I live in Chicago—it's for NYC now. I've visited Manhattan more than any other city that I've not lived in. I had a poster of the city hanging over my bed throughout highschool and I had planned on moving there after graduating from design school. I made frequent weekend trips, via the Chinatown bus, while in college and I loved every moment of them. However, my plans have been very organic and I've had the pleasure (minus this past winter) of living in some of our countries other great cities. That doesn't mean I've lost sight of the Big Apple, NYC is still in my future (*cough* jobs anyone?). 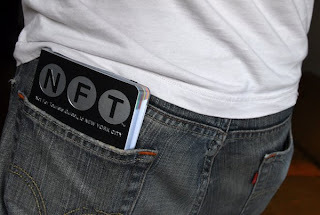 If you've never used an NFT Guide, check one out next time you are at the book store. The information design is incredible. Each neighborhood is broken down into three maps, each one highlights a different type of infrastructure (entertainment, essentials, and transportation). This keeps the maps uncluttered and legible. There is also a fold out map of the subway in the back. The books are called Not For Tourists because—unlike tourist guides—there are no photos of landmarks or instructions on how you should explore the city. It's a functional tool to help navigate the city yourself. I had planned on buying this before my last two trips to NYC, but always remembered before it was too late to order on Amazon (I wanted to save a few bucks). But this weekend I was at the Printer's Row Book Fair (where I got to meet Rob Walker) and they were being sold for $10, so I took advantage of the savings (and avoided the unnecessary shipping). It does bother me that NYC is the only book that fits in your pocket. When I asked about the sizing of them, I was told that it has to do with relative area of the city (which makes sense) and that the LA book is the largest because it's meant to be more of an auto resource, since no body leaves their vehicles there. It's good to have this back for future trips to NY.